LAS VEGAS, April 4, 2019 /PRNewswire/ -- Following the massive success of their Las Vegas shows in December 2018, GRAMMY® nominated world-class entertainers FLORIDA GEORGIA LINE will return to the Vegas Strip with their limited residency, FLORIDA GEORGIA LINE LIVE FROM LAS VEGAS inside Zappos Theater at Planet Hollywood Resort & Casino on November 6, 8, 9 and 12, as exclusively announced by People today. The anything-goes shows feature a set list that spans FGL's history-making #1 hits, including their 11X PLATINUM breakout "Cruise," "Meant to Be" with Bebe Rexha – up for ACM Single of the Year, Song of the Year and Music Event of the Year while earning iHeartRadio's Titanium Award for reaching 1 billion total audience spins in 2018 – "H.O.L.Y.," "May We All" (feat. Tim McGraw), and "God, Your Mama, And Me" (feat. Backstreet Boys), as well as fresh tunes from their recently released fourth studio album CAN'T SAY I AIN'T COUNTRY (BMLG Records), including chart-topper "Simple" and current single "Talk You Out of It." Tickets for FLORIDA GEORGIA LINE LIVE FROM LAS VEGAS will go on sale to the public Friday, April 12 at 10 a.m. PT. 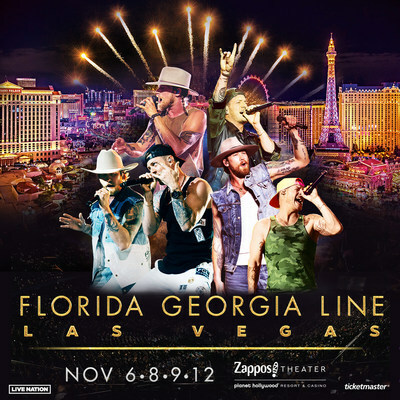 General ticket prices begin at $39, plus applicable tax and fees, and may be purchased online at ticketmaster.com/FGL or in-person at the Planet Hollywood box office. All shows begin at 8 p.m.
FGL's fan club community, FGL Lifers, have first access to a presale beginning Monday, April 8 at 10 a.m. PT through Thursday, April 11 at 10 p.m. PT. Citi is the official presale credit card for the FLORIDA GEORGIA LINE LIVE FROM LAS VEGAS residency. As such, Citi cardmembers will have access to purchase presale tickets beginning Tuesday, April 9 at 10 a.m. PT until Thursday, April 11 at 10 p.m. PT through Citi Entertainment. For complete presale details visit www.citientertainment.com. In addition, Total Rewards members, Caesars Entertainment's loyalty program, Live Nation, and Ticketmaster customers will have access to a presale running Wednesday, April 10 at 10 a.m. PT through Thursday, April 11 at 10 p.m. PT. Billboard's first-ever Trailblazer Award recipients have cultivated an ever-expanding empire of innovative artistry and entrepreneurial endeavors. Turning up the heat, FGL's fourth studio album CAN'T SAY I AIN'T COUNTRY (BMLG Records) has arrived, racking up over 515,400 album consumption globally to date. The project features their chart-rising single "Talk You Out of It" and PLATINUM chart-topper "Simple" (16th #1 overall as artists). Shadowing the applauded headline treks and FLORIDA GEORGIA LINE LIVE FROM LAS VEGAS residency, the pair will launch their 2019 CAN'T SAY I AIN'T COUNTRY TOUR this summer with support from Dan + Shay and Morgan Wallen, plus special guests HARDY and Canaan Smith on select dates. Exceeding 8.3 billion streams, 32.1 million tracks, and more than 4.5 million albums sold worldwide, the history-making duo became the first Country act to achieve RIAA's DIAMOND certification (10 million copies sold) for their 11X-PLATINUM breakout "Cruise," which is the best-selling digital Country single of all time (SoundScan). Since 2012, FGL has earned prestigious honors from the AMAs, CMA Awards, Billboard Music Awards, CMT Music Awards, and ACM Awards – currently up for Duo of the Year plus Single of the Year, Song of the Year, and Music Event of the Year (all for "Meant to Be" with Bebe Rexha) at the 54th Academy of Country Music Awards™. In addition to leaving their mark on several chart-crushing songs as writers, FGL's collaborations have also amplified their appeal, as most recently, their GRAMMY-nominated, 5X PLATINUM, #1 "Meant to Be" with Bebe Rexha led the Billboard Hot Country Songs chart for 50 straight weeks (the longest reign overall) and is a recipient of the iHeartRadio Titanium Award for reaching 1 billion total audience spins in 2018. The bona fide visionaries have launched their own Old Camp Peach Pecan Whiskey, as well as thriving businesses: FGL HOUSE, meet + greet, Tree Vibez Music, and Tribe Kelley. For more information about Florida Georgia Line, the 2019 CAN'T SAY I AIN'T COUNTRY TOUR and FGL Fest, please visit floridageorgialine.com and reach out on Facebook, Twitter and Instagram. Live Nation Entertainment (NYSE: LYV) is the world's leading live entertainment company comprised of global market leaders: Ticketmaster, Live Nation & House of Blues Concerts, LN Media and Artist Nation Management. Live Nation Las Vegas produces residency shows from Florida Georgia Line, Gwen Stefani, Backstreet Boys, Pitbull, Def Leppard and Christina Aguilera at Zappos Theater at Planet Hollywood Resort & Casino; Lady Gaga, Aerosmith, Janet Jackson, Bruno Mars, Stevie Wonder and Queen + Adam Lambert at Park Theater at Park MGM; Mariah Carey at The Colosseum at Caesars Palace; and Blink 182, Billy Idol and Lady Antebellum at Pearl Concert Theater at the Palms. Live Nation Las Vegas also brings other world-famous artists to many of the city's other premier concert venues including T-Mobile Arena, Mandalay Bay Events Center, MGM Grand Garden Arena, House of Blues, Downtown Las Vegas Events Center, The Joint at Hard Rock Hotel & Casino Las Vegas, and more. For additional information, visit www.livenation.com. Find Live Nation Las Vegas on Facebook, Instagram and follow us on Twitter. Celebrating 10 years, Planet Hollywood Resort & Casino is the centerpiece of the famed Las Vegas Strip, with 2,500 beautifully redesigned guest rooms and suites showcasing some of the best views in town, along with endless options of unparalleled shopping, distinguished dining, popular entertainment and a bustling nightlife. A bright, bold addition to the resort's portfolio, the new Ultra Hip Rooms feature contemporary elegance and luxury bedding. Known as the place to play for its roster of A-list celebrity guests, Planet Hollywood's 231 newly restyled suites feature stunning views of the glittering skyline and daring décor elements such as suspended sofas, lounge-style living spaces and oversized modern artwork. The resort encompasses more than 100,000 square-feet of gaming, several lounges, impressive restaurants including Gordon Ramsay Burger, KOI, Strip House, and the award-winning Spice Market Buffet, an intimate wedding chapel and the Planet Hollywood Spa by Mandara. The resort also features The Scene Pool Deck with the Strip's first and only stand-alone wave machine, the FlowRider. Home to the first pop music residency in Las Vegas, Zappos Theater showcases resident headliners Backstreet Boys, Gwen Stefani, Christina Aguilera, Pitbull and Def Leppard. Magician Criss Angel performs an over-the-top visual spectacular of "Criss Angel MINDFREAK®" in the newly-renovated Criss Angel Theater. The property is encircled by Miracle Mile Shops with more than 170 specialty stores and restaurants. Planet Hollywood Resort & Casino is operated by a subsidiary of Caesars Entertainment Corporation. For more information, please visit planethollywoodresort.com or the Caesars Entertainment Las Vegas media room. Find Planet Hollywood Resort & Casino on Facebook and follow on Twitter and Instagram.